Rice production in Cambodia covers an area that is approximately 60% of the total area, or 181,035 square kilometers. According to Cambodia’s General Census 2008 by the Ministry of Planning, about 72.3% of Cambodians are farmers. Due to the extent of rice production, rice is the primary staple for Cambodians and many other countries in Asia. These days farmers attempt to develop rice production rapidly, especially white rice, to meet the demands of an increasing population. Facing food shortages, farmers are interested in modern intensive rice cultivation to gain higher yields and ensure food security. Rice production has increased from year to year and recently the government of Cambodia has begun plans for the exportation of rice abroad. Some people involved in agricultural works only grow enough to support their own means, whilst others are able to produce a surplus to sell. The surplus in rice production enables Cambodia to export rice. Rice cultivation techniques have not been disseminated to the public, and the correct selection of seeds and care has not been paid attention to (water, fertilizer). This is why our rice production does not succeed in all areas. 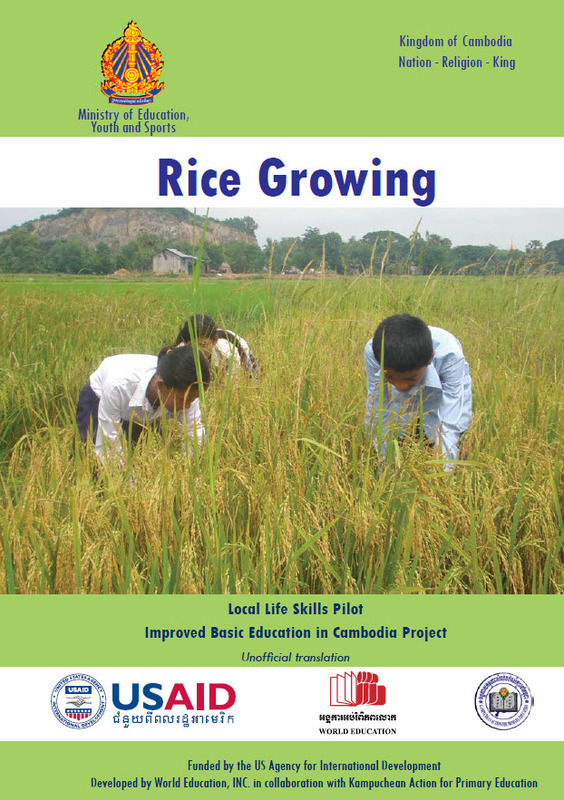 As a result, the Committee for Agricultural Development has prepared this document on Rice Production to aid students in learning more successful techniques for cultivation. The main objective of the rice production manual is to help students gain knowledge, skills and experience in simple life skills. This document plays a crucial role for agricultural production in their families. 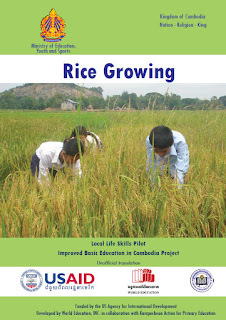 Studying how to plant rice crops from a young age is linked to the livelihood priorities wishes of students, and can enable the people to reduce unemployment and lack of understanding of agricultural production. We hope that the next generation is able to prepare for rice production, such as financial and resource planning, so as to improve their families situation.